Eleven-year-old Evin Catron crushed it on his first day as a hooligan fisherman. 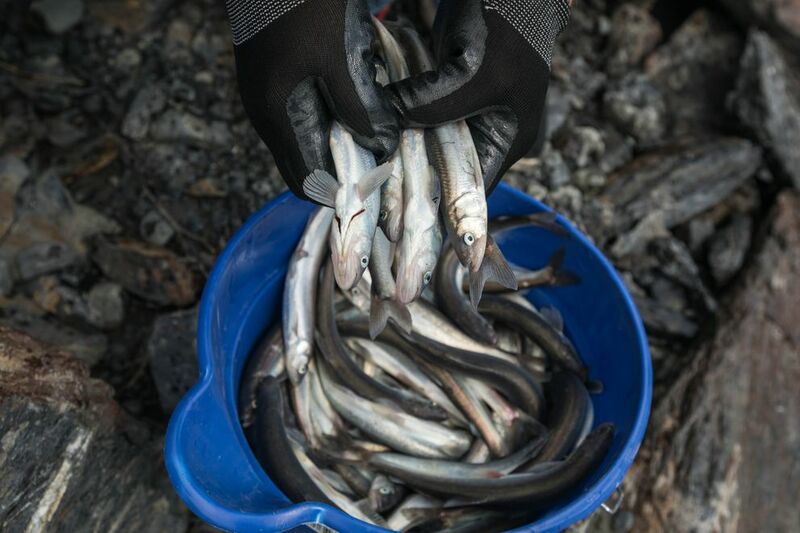 In about an hour's time at the Twentymile River south of Girdwood, the Palmer boy netted a couple dozen of the slender silver fish that for Alaskans represent the promise of much bigger things. 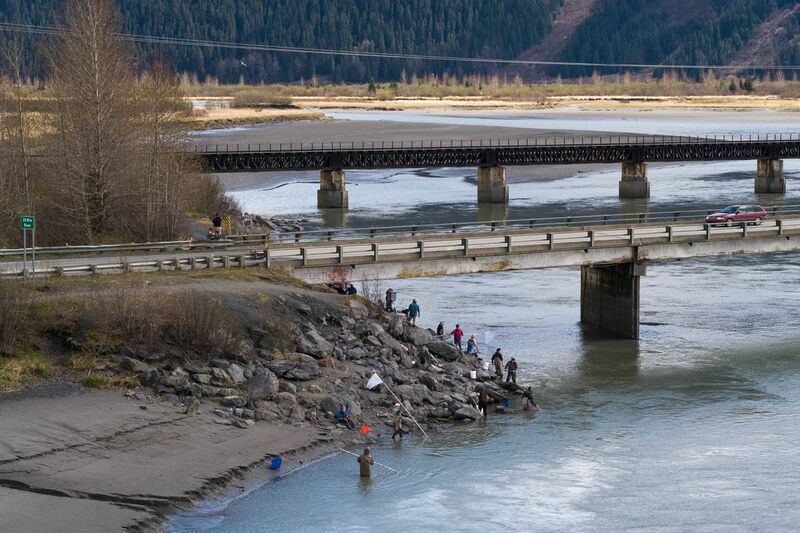 The brief hooligan season — it ends May 31 in saltwater and June 15 in fresh water — ushers in the Southcentral Alaska fishing season. Once hooligan migrate from the ocean, the salmon aren't far behind. And while hooking a mammoth king is the prize catch for most Alaskans, the humble hooligan has its fans too. "It's a once-a-year thing, so it's a treat," said Louise Britton, who grew up in the Lower Yukon and lives in Anchorage. "I fry them two or three minutes, turn them over and fry them another two or three minutes, and then I eat 10 of them. "They're quick to fry, and quick to eat." Catron didn't need to do much prep work for his day on the river. "I came here like this," he said, dressed in a T-shirt and jeans as he stood next to his bucket of fish, some of them still breathing. "Except I changed my shoes." He didn't need to do much work afterward, either. Catron made his rookie hooligan trip under the supervision of his grandmother, Cindy Todd of Kenai, who knows exactly what to do with hooligan. "Chop their heads off, thumb through the guts, sauté them in a pan of olive oil and eat them right away," she said. "I eat mine right off the bone. The fresher the better." Todd also knows what not to do with hooligan. "I had some frozen once and I didn't like them," she said. "And I pickled some once before and I didn't like them." Beyond that, there's not much not to like about hooligan, especially fishing for them. No hooks to bait or lines to untangle. No pile of guts to dispose of. No limit to worry about. And very little chance of going home empty-handed. Some people catch hooligan by the bucketful; others, like Catron and Todd, call it quits when they have enough to fill a frying pan or two. The key is that if you're fishing for hooligan while the tide is coming in, you're not likely to get skunked. Around noon Tuesday, there were as many bald eagles fishing for hooligan as there were humans. Both species were having moderate success. Britton was among 20 people who were at Twentymile River with the Southcentral Foundation's Elder Program. Members of the group talked about frying hooligan, baking them, smoking them and boiling them — usually with the heads still on. "I fry them up in oil till they're crispy," group member Tasha Nelson said. "You can eat the crunchy ones like dried jerkies. I know there are bones in them, but I chew them up and swallow them." Twentymile is the most popular place for Anchorage residents to find hooligan. There's a parking lot on the Turnagain Arm side of the Seward Highway, and you can fish on either side of the road. Many take their long-handled dipnets across the highway and make the short, rocky walk down to the riverbank. The best time to fish is on an incoming tide. 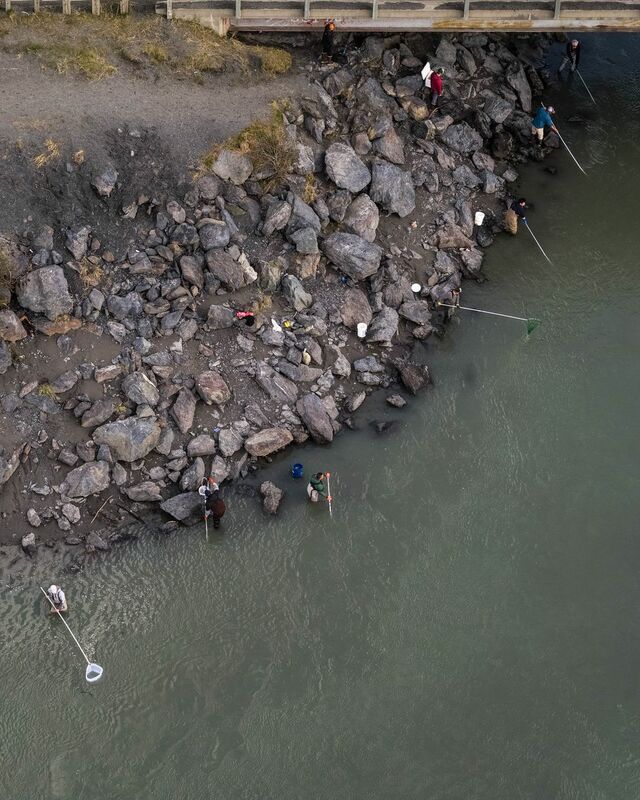 "They're weak swimmers, so they use that tide to move up that river," said Shane Hertzog of Alaska Department of Fish and Game. "A flood tide really slows down (the fishing) because they can spread out." 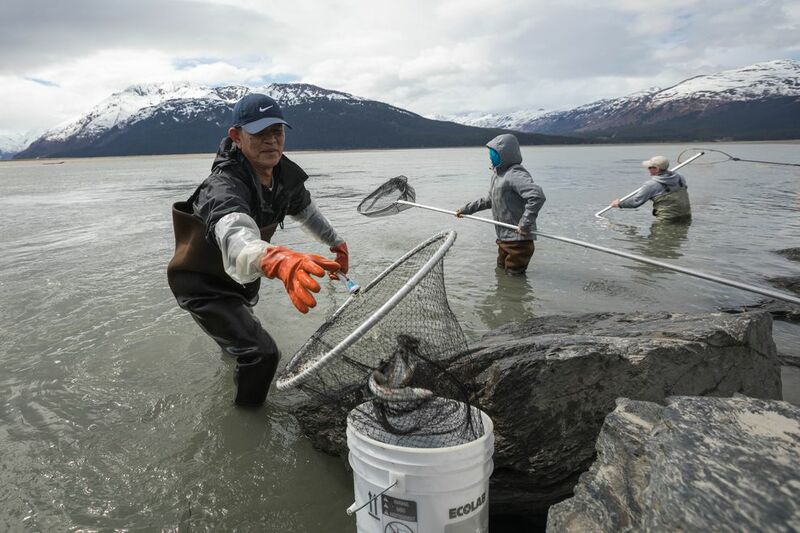 The personal-use hooligan season is open to Alaskans with resident fishing licenses, which makes Bill Hagemeyer a new but devoted fan of the fishery. Hagemeyer and his wife moved to Anchorage from Florida in November 2016. He had never heard of hooligan before but quickly developed a taste for catching them, and eating them. "I got 600 last week," he said. He likes them sprinkled with cayenne pepper and sauteed in a little olive oil. "The meat falls off the bone," he said. "You can even eat the bones." Jacky Graham, who has lived in Girdwood for more than 40 years, is a bit of a hooligan gourmet. She recommends Yoshida marinade for a brine when smoking them, "and don't smoke them too long," she warned. Graham said her goal this year is three dozen hooligan, which she will smoke, freeze and eat for the rest of the year. She still has some of last year's catch in her freezer. "I believe before you fish you should eat fish," Graham said, "so I just ate three hooligans before I came."